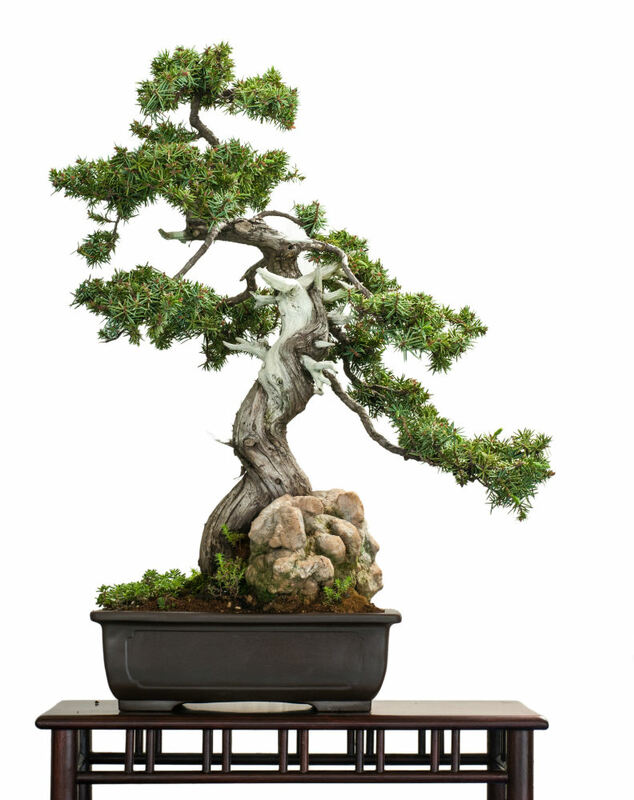 Fukien Tea Bonsai are some of the most prestigious, one-of-a-kind specimen bonsai in the world. 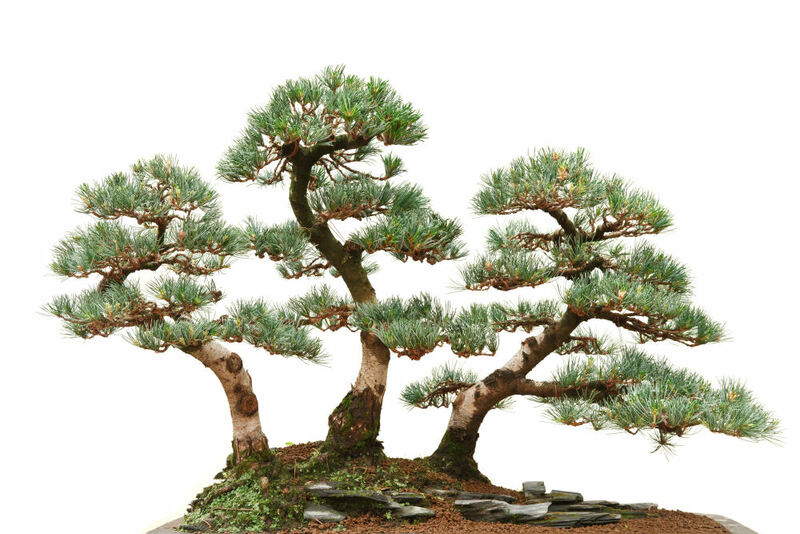 These trees begin to look aged earlier than most other trees suitable for bonsai. 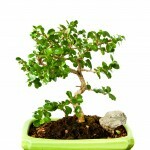 They sport small dark-green, shiny leaves that grow in small clumps. 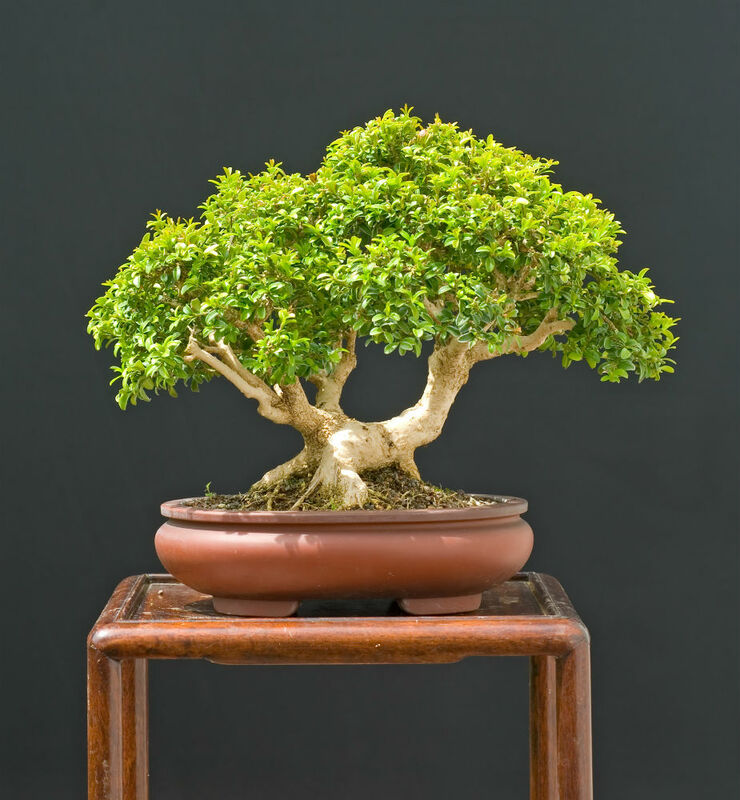 During the growing season, your Fukien Tea tree will produce small white flowers that turn into small red berries. 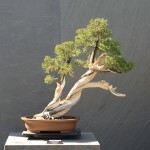 The light brown bark of this species will become cracked and fissured in appearance, adding to the aged look of the tree. 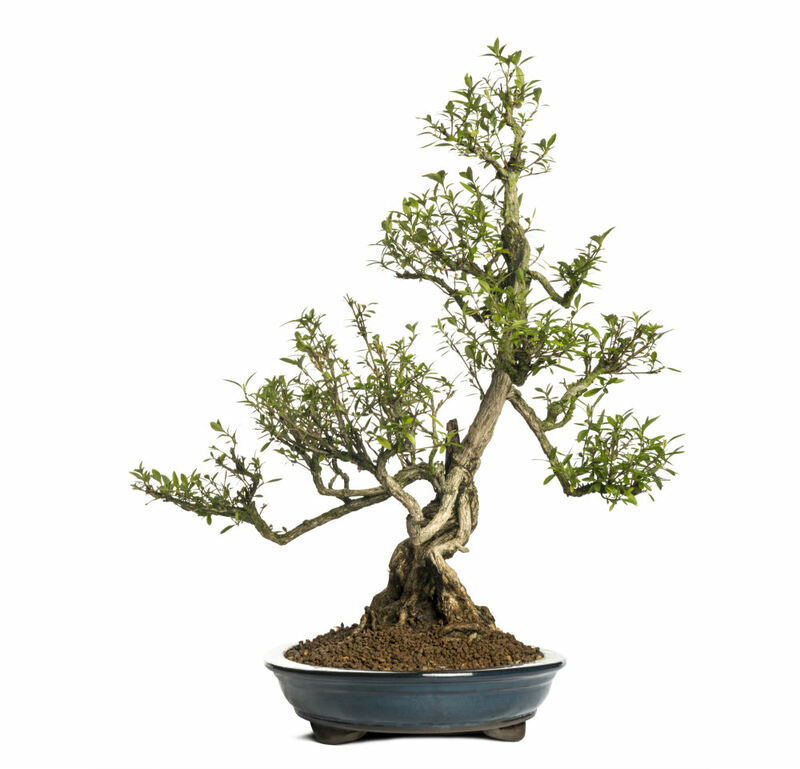 A Fukien Tea trees needs a considerable amount of water on a regular basis. 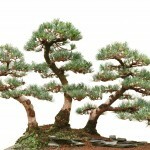 Being in full sun, the soil will dry out much faster than most other miniature trees. You should check the soil at least once a day, and water if it feel s dry. 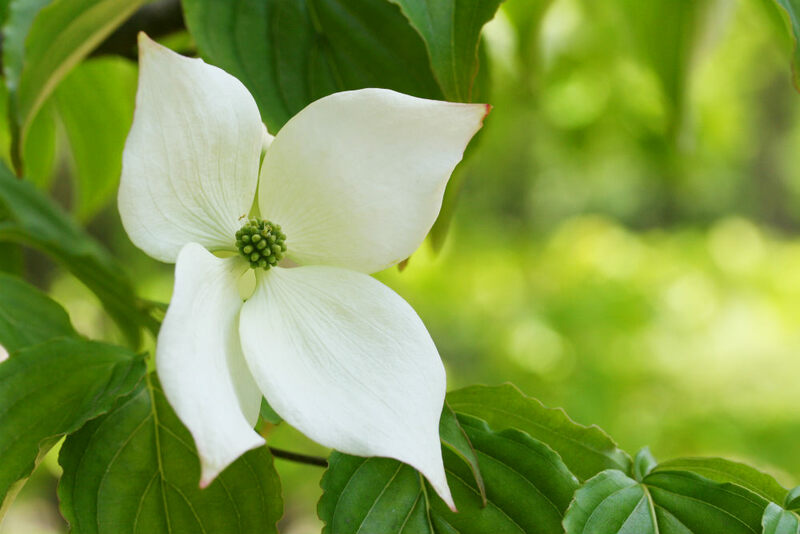 You should submerge the entire pot in water for a few minutes and then let excess water runoff before returning the plant to its original location. 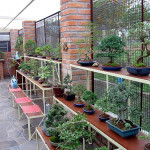 Fukien Tea trees require a large amount of humidity and are traditionally placed in a humidity tray. 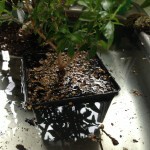 The humidity tray provides a small bubble of moisture around the tree to keep the tree from drying out. 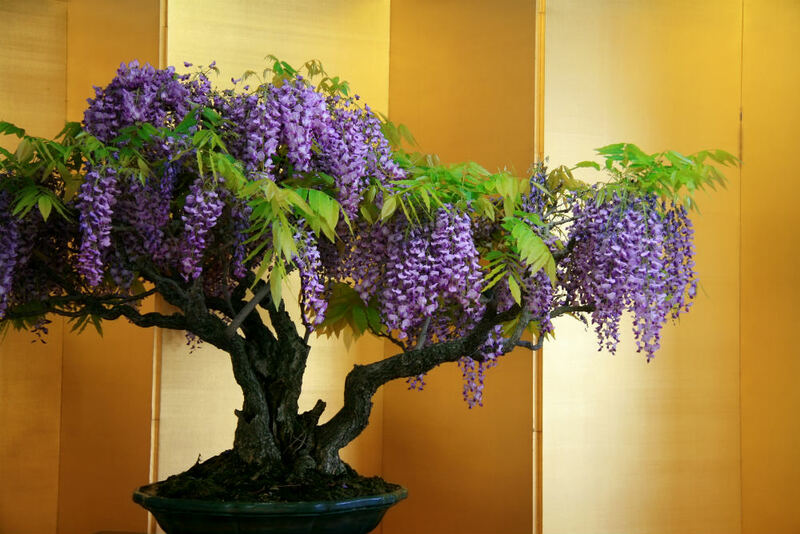 Periodically spraying the tree with a mist bottle will also help improve humidity. This will also help keep the soil from drying out quickly. 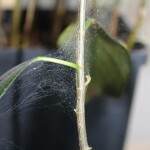 This species is typically kept indoors, unless you live in a very warm and humid environment. 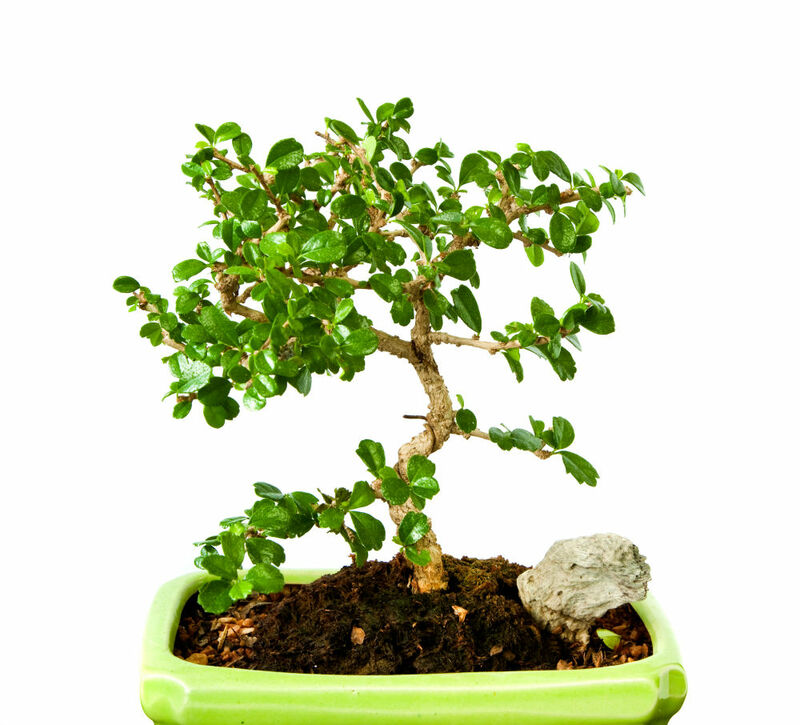 Place you Fukien Tea tree in full sun with at least one hour of direct sunlight a day, preferably morning sun. 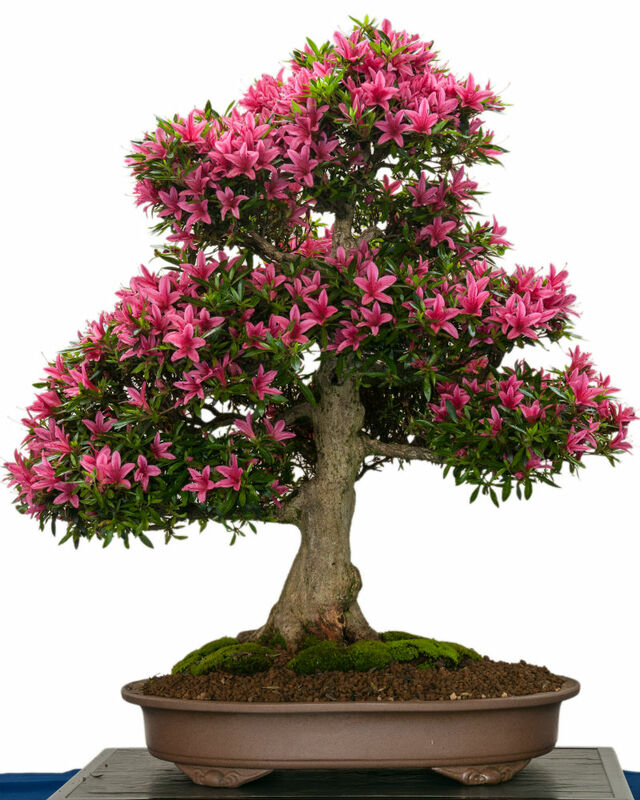 Your Fukien Tea tree will produce more flowers and berries if set in a well lit, full sun location. 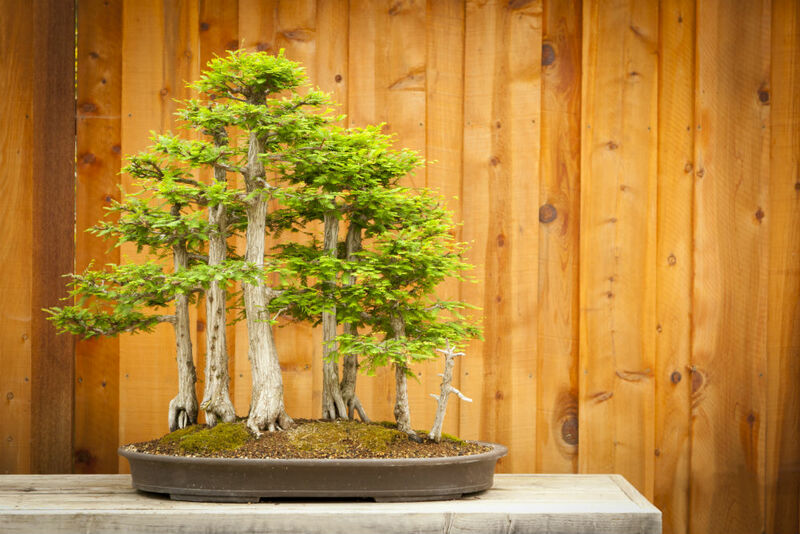 This species of miniature tree grows slowly, but will still need to be pruned to stay small. 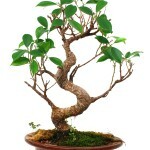 Prune leaves back to 3-4 leaves per branch after you notice 7 or 8 have grown. 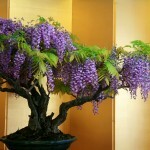 These trees can be easily shaped with hard pruning at any time of the year. 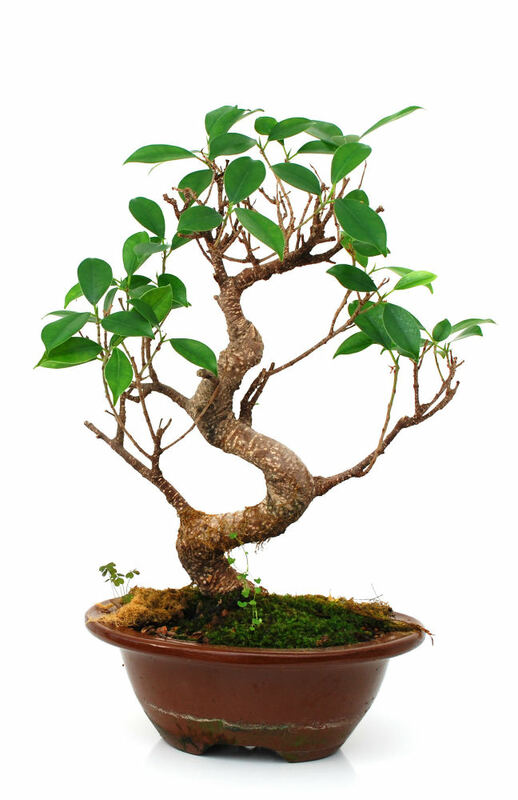 Fukien Tea trees should be repotted every 2 to 3 years, removing no more than 20% of surface roots. 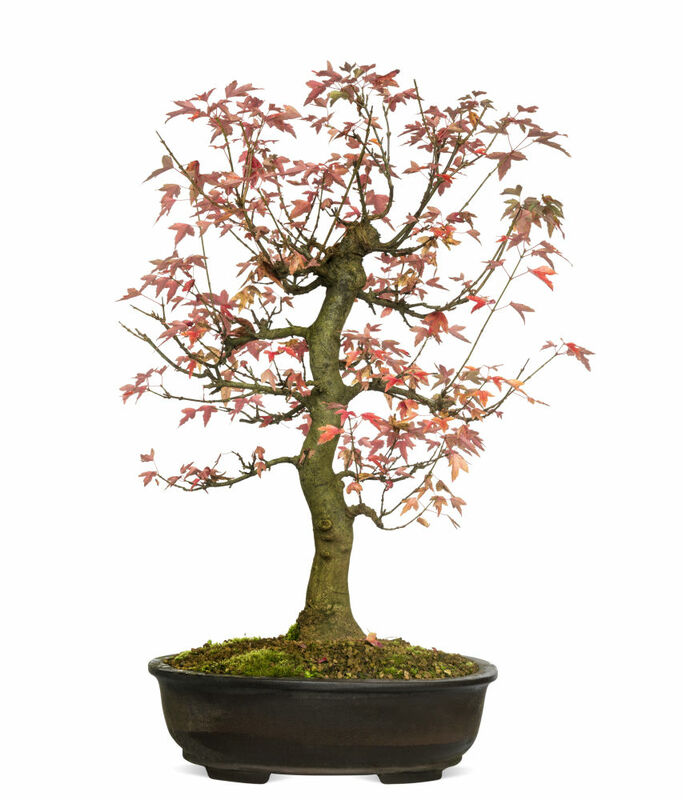 Repot your Fukien Tea tree in early spring, just before its biggest growing season. 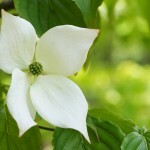 This will replenish the nutrients in the soil and leave more room for new roots to grow. 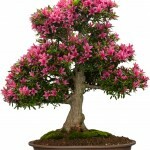 Do not fertilize your tree for a month after repotting. 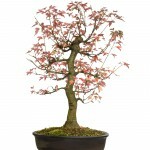 In early spring, use a high phosphorus fertilizer, feeding the tree weekly. 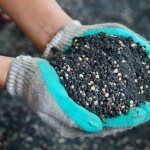 In late fall, switch to a high potassium fertilizer twice a month and continue through winter. 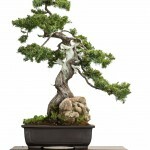 I have a medium Fukien Tea bonsai (aprox. 7 inches tall) that I purchased 3.5 weeks ago. 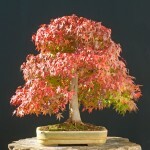 At first it thrived but now it is losing leaves rapidly. 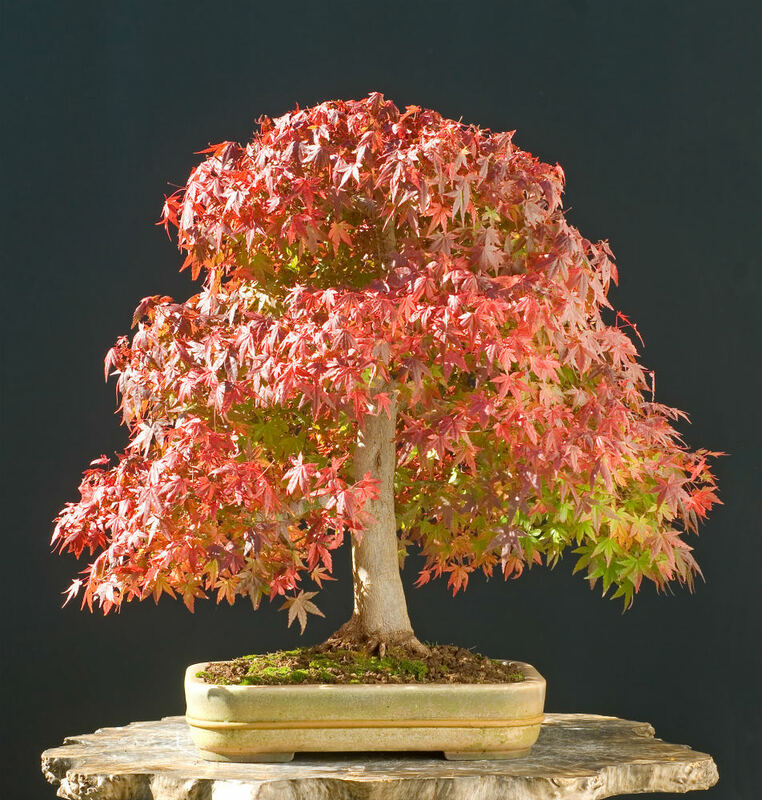 The remaining leaves are wrinkling and drooping. There has not been any sunny days lately. I am worried about my tree. I placed it under a Sunbox 2 days ago for artificial light and there has been less leaf loss, The soil is moist but not saturated. I occasionally mist it with water and am using a humidity tray (pot is not resting in water). I talk to him and provide soothing music. 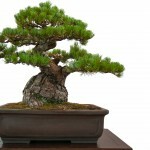 PLEASE help me save my bonsai. Any information or comments are greatly appreciated. Thanks!